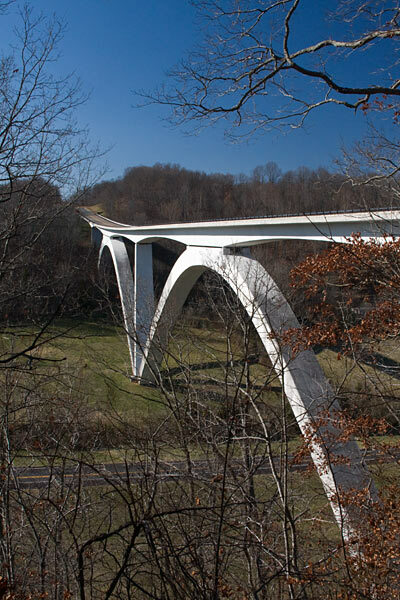 The concept of the Natchez Trace Parkway is similar to that of the Blue Ridge Parkway - except no mountains. 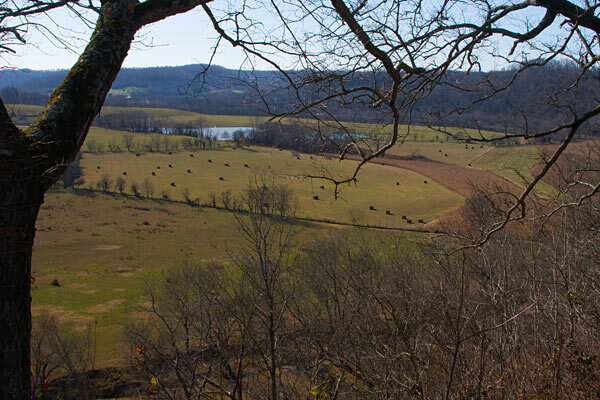 For the most part, the Natchez Trace Parkway is through rolling hills and flatlands. 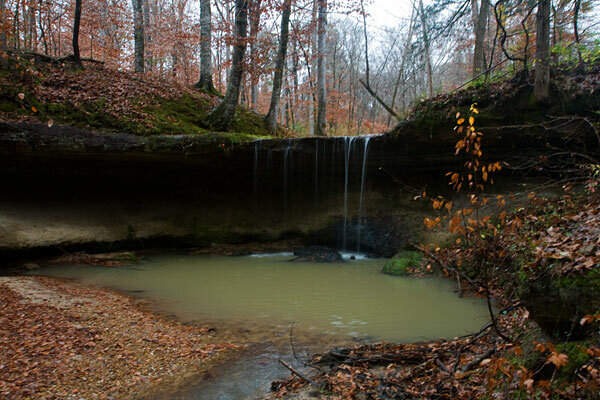 The Natchez trace is the longest and narrowest National Park we have - it's 444 miles long and perhaps a couple hundred yards wide. 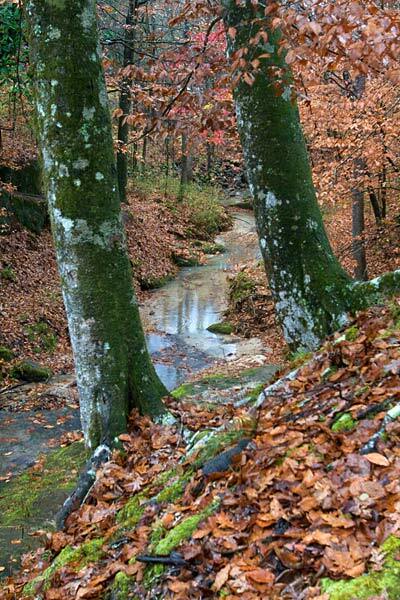 The parkway follows the route of the original Natchez Trace. 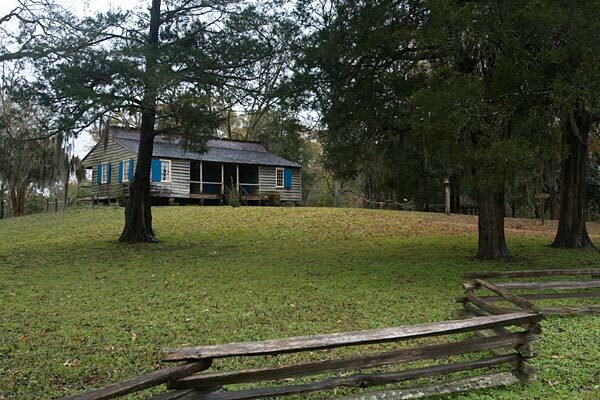 At first, the trace was probably a series of hunters' paths that came to form a trail running from the Mississippi River near what was to become Natchez, to Tennessee. 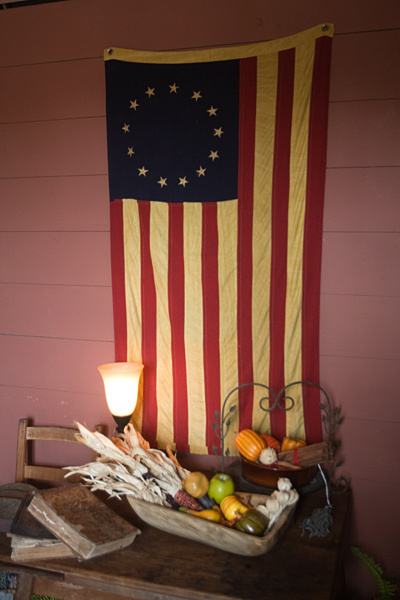 By the late 1700s, Ohio River Valley farmers were floating their crops down the rivers to Natchez and New Orleans. Since they could easily drift their boats down the Mississippi but couldn't pole them back up the Mississippi, they sold them in Natchez or New Orleans for the lumber. So that meant they had to ride back home or walk. 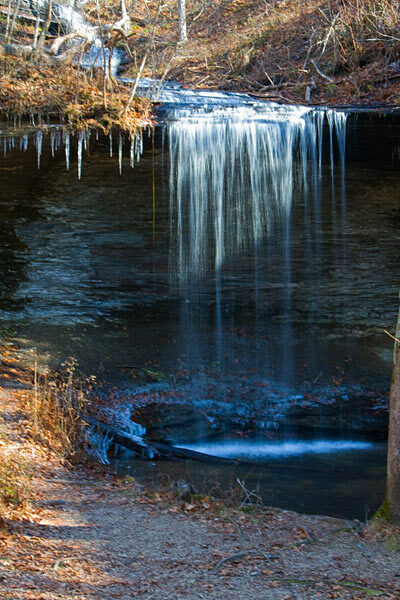 The trail from Natchez to Mid-Tennessee was the most direct route and so became the Natchez Trace! Eventually, the appearance of steamboats plying their trade on the rivers put an end to the walk up the trace as most chose to return home by way of steamboat. Development of the Parkway began in the late 1930s and wasn't finished until the 1990s. Driving the parkway from north to south, this bridge is one of the first features of the parkway you see. This double arch bridge rises some 155 feet above the valley. It was completed in 1994. 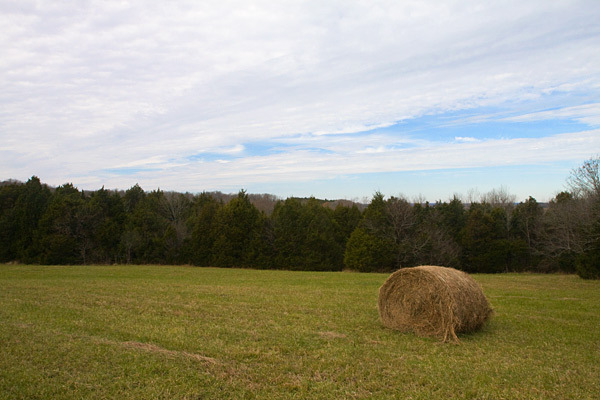 Much of the scenery along the parkway is like this - farmland stretching for miles. 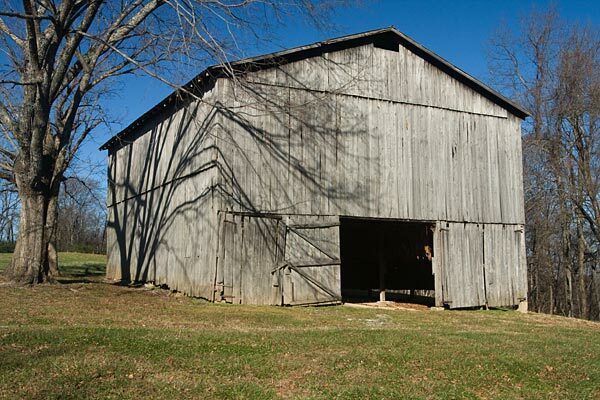 An old tobacco barn at mile 401. Jackson Falls. Yep. It's cold. Those are icicles on the lip of the falls! 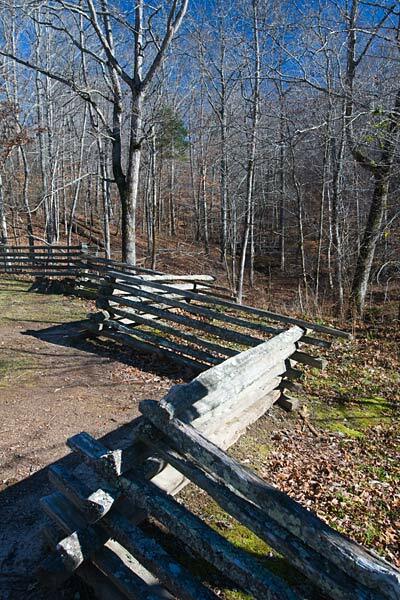 One of the ubiquitous stacked fences along the parkway. There must be a couple hundred miles of these fences. 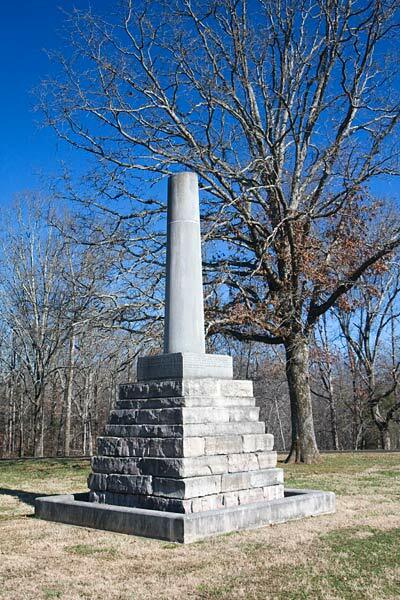 The grave of Meriwether Lewis in a pioneer graveyard at mile 386. 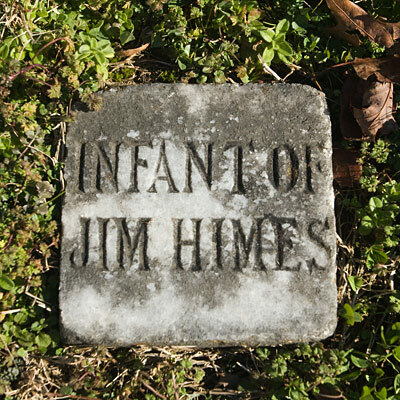 One of the many markers in the pioneer graveyard. 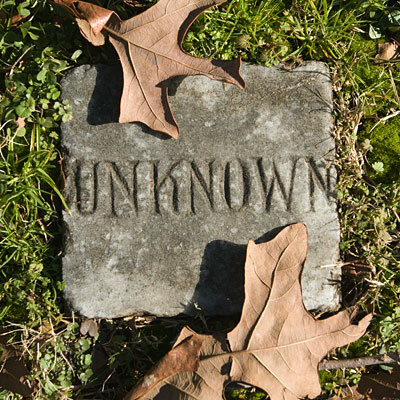 And of course, many are unknown. These stones are about 6 x 6. 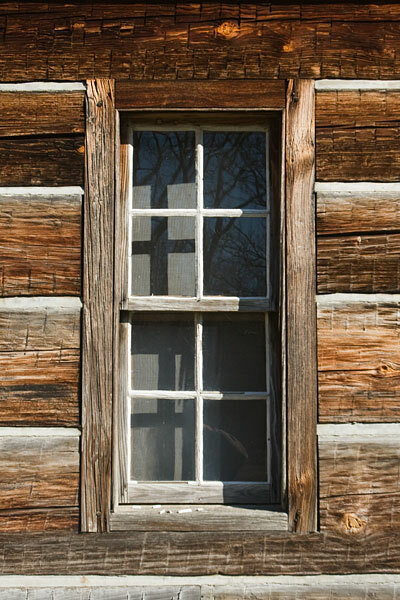 A window on a cottage at the Meriwether Lewis graveyard. 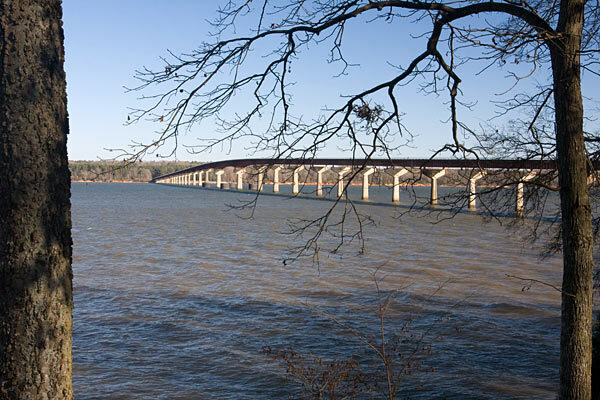 The bridge over the Tennessee-Tombigbee Waterway at mile 293. 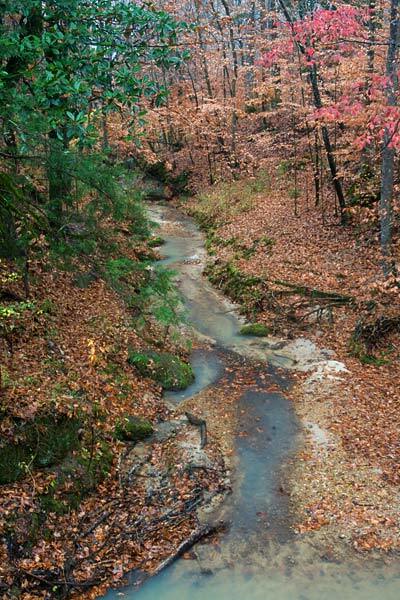 This waterway makes 460 miles navigable between the Gulf of Mexico and the Tennessee River. The first day on the trace I made it from Nashville TN to Tupelo MS, Elvis' birthplace. I decided to stay only one night - I really had no desire to check out Elvis' birthplace. For my first day on the trace, the weather was nice - a little on the chilly side, but nice and sunny. My second day, from Tupelo MS to Jackson MS was not to be so nice. It looked like I was driving right into that big weather system that eventually dropped 20 some inches of snow in PA. The drive wasn't too bad though - since I was on the trace in the middle of the week and in the off-season, there was little traffic and I could move right along. A typical scene along the parkway. The weather started to fall apart after this! 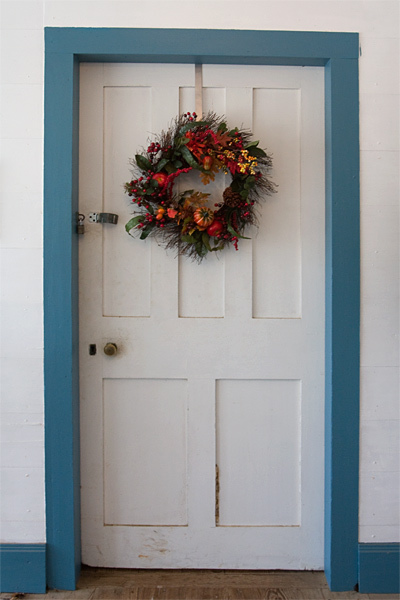 A door to the stand at French Camp. 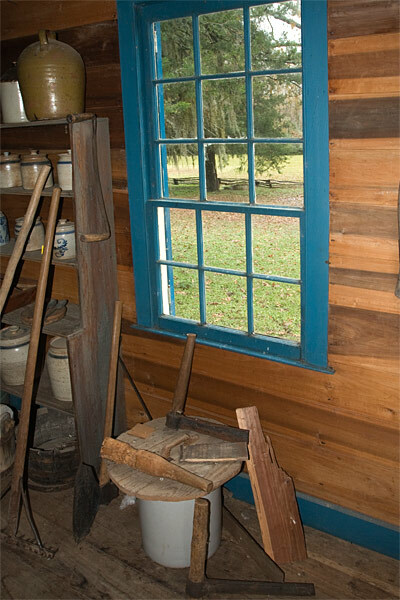 In 1812, frenchman Louis LeFleur built a "stand" here that remains to this day. 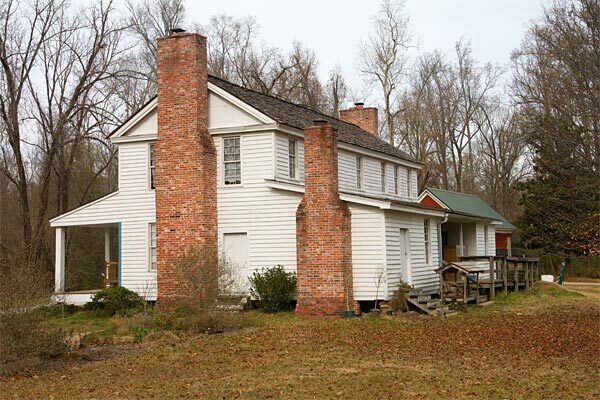 A "stand" is a local name for an inn - many of which were built along the trace to serve the travelers. 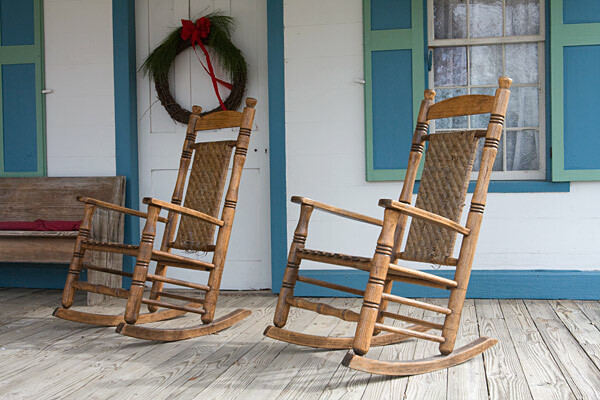 All you need is a mint-julep and you'd be right at home on the porch of this stand. The Stand at French Camp. 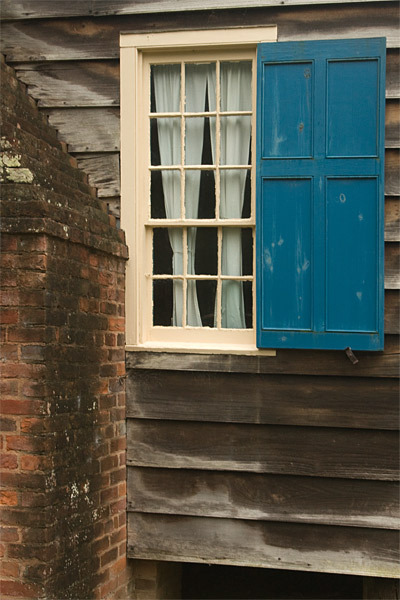 A window on the stand. 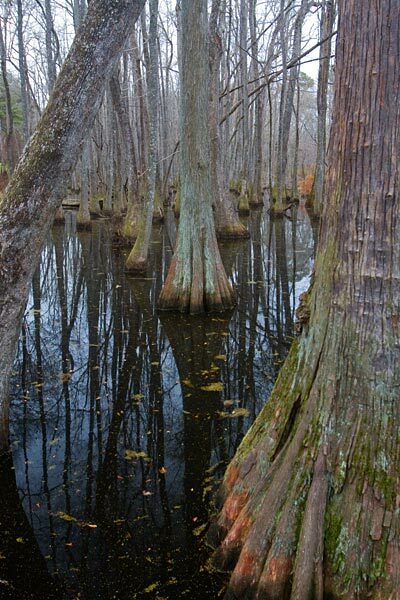 A Cypress swamp at mile 122. 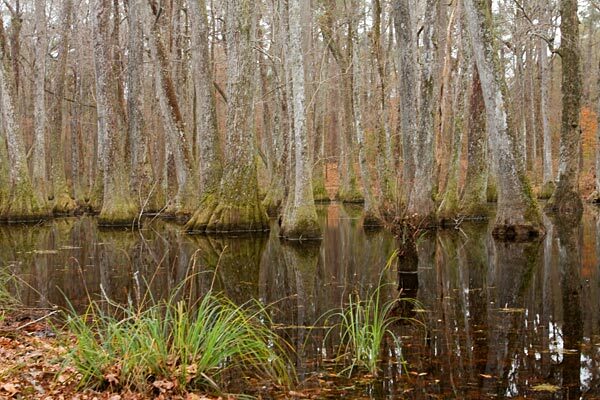 More of the swamp. I didn't see any alligators, but I was watching for 'em! For my second evening on the trace, I stayed at a campground in Jackson MS. I wouldn't recommend a stay in Jackson. So for my third day on the trace, the weather was getting worse. There was very little let-up in the rain all day. Owens Creed waterfall at mile 53. This creek is normally dry except for very wet weather. Well, it was very wet weather!! 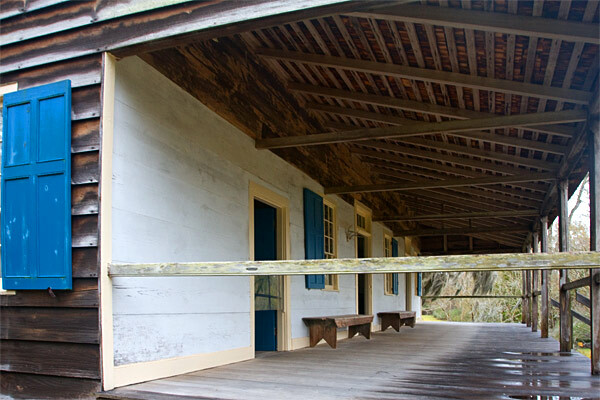 Mount Locust stand at mile 15 has been restored. This is one of the earliest and most well known of the stands on the trace. 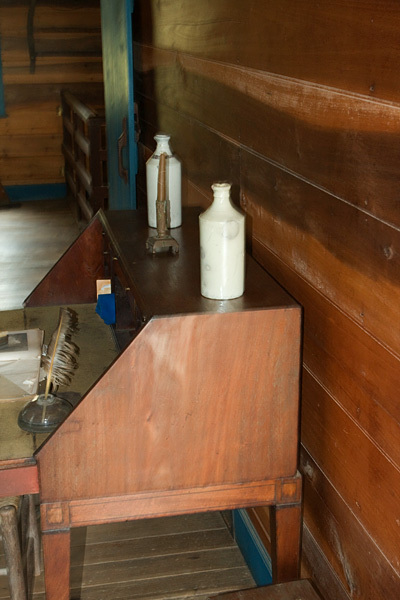 One of the displays in the Mount Locust stand. 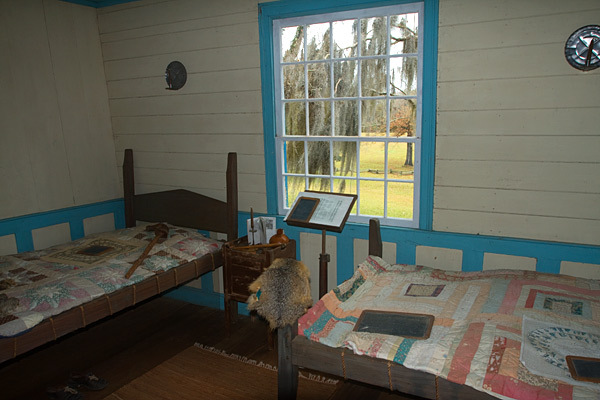 A bedroom in the stand. Another display in the stand. I arrived in Natchez MS and went to a campground across the Mississippi in Vidalia LA. I was right on the river and could watch the river barges passing by. You could barely hear the ones coming downstream as they were mostly drifting with the current. Those coming upstream were struggling and you could hear them coming a mile away! Too bad the weather was so rotten, I could've gotten some nice pictures. I was staying in Natchez a couple nights - I wanted to see the Natchez City Cemetery - don't ask. Pictures forthcoming.